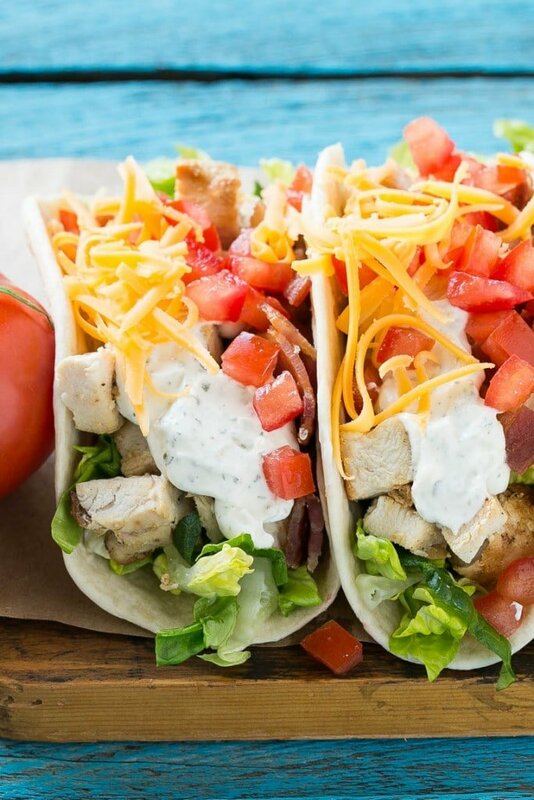 How do you make chicken ranch tacos? 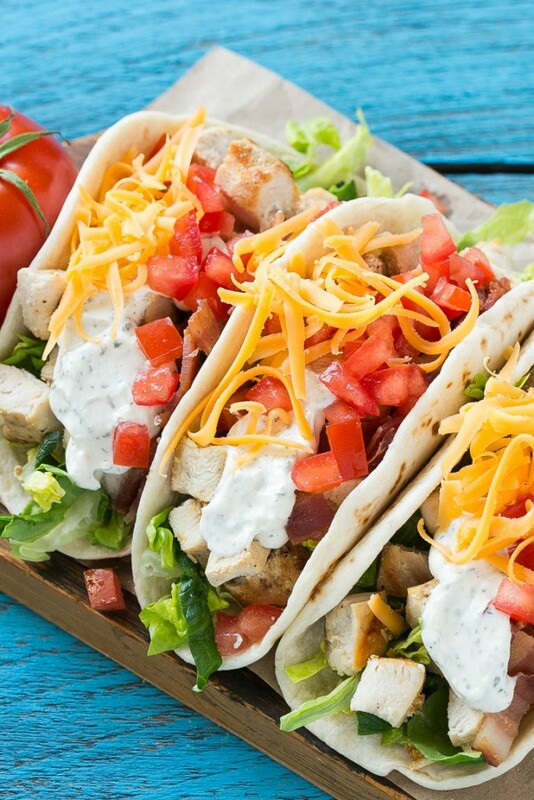 While clearly there’s nothing Mexican about these chicken ranch tacos, they’re a fun way to serve up some familiar (and family friendly!) flavors. Here’s a step by step video showing you how to assemble them! 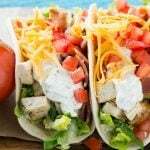 This recipe for chicken ranch tacos is grilled chicken with bacon, homemade ranch sauce, cheese and fresh vegetables, all stuffed inside warm flour tortillas. A family friendly meal that's simple to make and fun to eat! My family loves these tacos! I always add avacado to them! These were so easy to make, taste amazingly delicious ????. I added jalapeño to the dressing . These are so delicious! Made them once, now I’m making them again! What’s good for the side dishes ? Thank you for responding (: dinner was a success!???????? How can I make the ranch sauce? Made these tacos last night for my family, and set all the ingredients out in bowls for everyone to make their own. My son started putting his (light) ranch dressing on the tortilla, so he would have a “bit of ranch in every bite” and we all had to follow. Loved them!! And super easy to make! I also am a taco and ranch fan! I’m with you–I’ll wrap just about anything in a tortilla for a great meal! And I just so happen to have a leftover grilled chicken breast in my fridge from last night’s dinner…I see lunch in my future! Oh my, these look so amazing! Chicken-bacon-ranch is one of my favorite flavor combinations. Those tacos look amazing! What a great flavor combination. 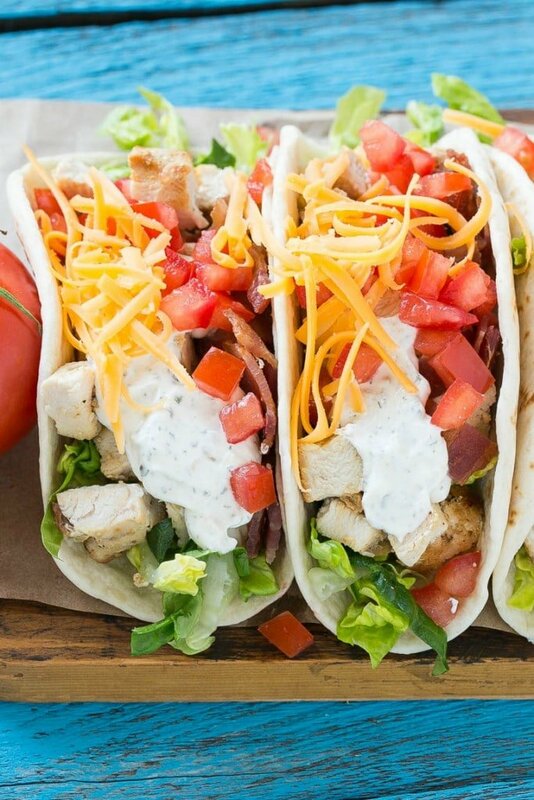 What a great idea to add ranch to your tacos! I’ve never put ranch on a taco, but I will now. Yum! !